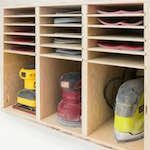 Build a wall mounted sandpaper disk storage rack for your workshop using these free woodworking plans. Build a sandpaper disk organizer using these free instructions. There is a video at the link as well as free downloadable woodworking plans. It is amazing how this little sandpaper cutting jig will make life easier in the workshop. Here is how to build one for yourself. 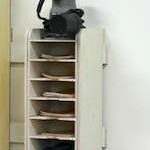 This wall mounted workshop sandpaper storage unit will help keep your sandpaper organized, flat and within easy reach. This sandpaper ripping jig is simple and cheap to build, and it will save you tons of time in the long run. This is a link to a Google 3D SketchUp drawing for a downdraft sanding table. You will need the SketchUp software to download this drawing and its freely available online. We do not provide support for this software.